Schwartz & Wade, 9780375867453, 56pp. When Widow Tulip Jones of Bore, England, inherits a ranch in By-Golly Gully, Texas, and moves in with two trunks of tea, twelve pet tortoises, and three servants, hilarity ensues. The peaceful life suits the wealthy widow fine until word gets out and every unmarried man in Texas lines up to marry her. Widow Tulip and her small staff of three can't possibly run the farm and manage all the suitors, so she devises a plan—and it just might work. This story filled with giant tortoises, 1,000 brides, bad guys, a smart widow, and even a little romance is sure to get kids laughing. 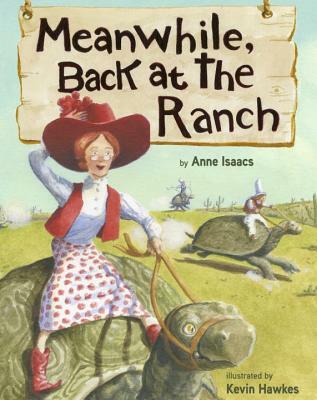 ANNE ISSACS is the author of Swamp Angel, a Caldecott Honor and ALA Notable Book; and its sequel, Dust Devil, which received four starred reviews; the Ghosts of Luckless Gulch, a New York Public Library Best Book; Treehouse Tales, a Junior Library Guild selection; Cat Up a Tree, a New York Public Library Title for Reading and Sharing; Torn Thread, an ALA Notable Book and a National Jewish Book Award finalist; and Pancakes for Supper, winner of the Oppenheim Toy Portfolio Platinum Award. KEVIN HAWKES is the illustrator of Velma Gratch and the Way Cool Butterfly, My Little Sister Ate One Hare, Library Lion, Weslandia, and The Road to Oz. He also wrote and illustrated Wicked Big Toddlah.